Puede seleccionar como máximo 9 viajeros en total. Cuando su crucero atraca en el Pireo, sea testigo de los aspectos clásicos de Atenas en una excursión guiada de 4 horas en tierra. Viaje en un vehículo con aire acondicionado a la estación de metro Syntagma para ver su fascinante museo arqueológico, y camine por el sitio peatonal Dionysiou Areopagitou, que incluye el Teatro Herodian y Mars Hill. En la Acrópolis, inspecciona el Partenón, el templo que personificó el poder ateniense en el siglo V aC, según tu guía detalla su diseño. Contempla las vistas de la ciudad estelar desde aquí y disfruta del tiempo libre para explorar Atenas de forma independiente antes de regresar a El Pireo. Excursión de 4 horas por la Acrópolis y el centro de Atenas, con un guía experto. Vea el Parlamento griego, el Templo de Zeus, el Teatro Herodiano y otros lugares destacados. After figuring some things out the tour went very well...Thr tour was acually in 3 parts with 3 different guides which we didn't expect and was a bit odd but it turned out to be fine. The last part was the best - the walking tour of the Parthenon with Alexandros - he was OUTSTANDING. He was young, enthusiastic and incredibly knowledgeable. Highly recommend. We were in Athens in 11/17 and it was pouring down rain! Our guide was wonderful and even though we were wet she gave us a great tour. After lunch the sun came out and were were able to see all of Athens. Great Guide! We were in Athens in 11/17 and it was pouring rain. But, our guide was wonderful and after lunch the sun came out and we were able to see Athens. This was awesome. We had our guide named Sophia, and I hope I had her name right. She was very knowledgeable with the histories and spoke a good English. She made sure to answer any questions if our group had any. I should have read this tour better. I was surprised that the price of the tour didn't include the entrance fees52 euros for the two of us that had to be paid in cash at the start of the tour. The tour guide we had was very good, but once we got to the top of the Acropolis, half of the group had purchased a different tour that also went to Acropolis museum. We didn't have that tour so the guide said goodby to use at the top of the Acropolis and we had to make our own way back to the meeting place to get the cabs back to the ship. It was rushed tour. Not recommended for those who cannot walk fast. It was an ok tour. Will l fo it again with this company? No l will not. Maybe it was the particular tour guide we got that day but this tour was too rushed. Dorina was a fantastic guide. 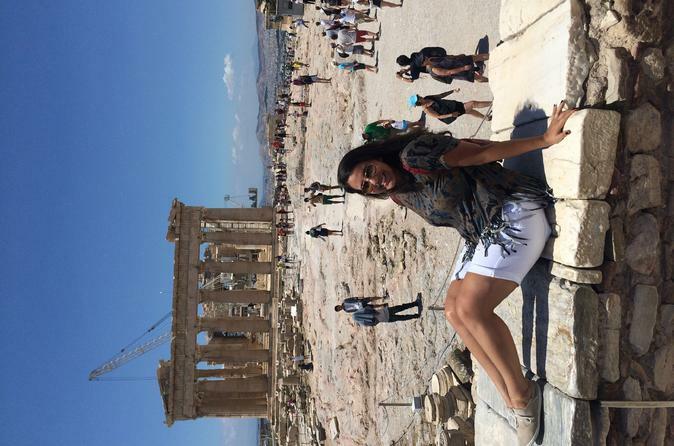 Incredible knowledge and passion for Athens and her work as a tour guide. She provided detailed insight into each area we visited beginning with the excavation at the train station. She was thoughtful and took bathroom breaks and paced the climb to the top of the Acropolis with breaks to provide historical context and made it easer for a handicapped person in our group. The majority of our small group did not travel on to the museum of the Acropolis afterwards and instead went to Plaka the nearby town, which I highly recommend. Here you will find narrow winding streets of the old town with shops and plenty of tavernas with excellent, authentic Greek food at excelled prices, and great for sitting outside to people watch. An incredible value for the price. Pick and drop off at the ship was effortless. I would highly recommend this tour rather that transporting and purchasing tickets on your own, which we usually do. One of the best tours we have taken. Walking from Syntagma Square to the top of the Acropolis is not for those who have mobility issues. On the other hand, if you can walk for short stretches, with plenty of breaks, you can do this. Many of the folks on our tour were 70 in age, and were able to complete the hike up and back. 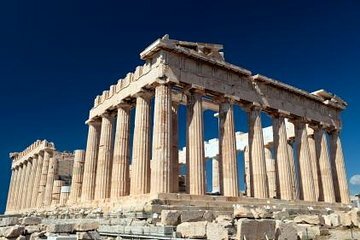 The narratives given by our guide, Dori, were very good and helped us understand the city, its parks and monuments, and the attractions of the Acropolis. Highly recommended. Tour was great. Guide was very knowledgeable and interesting. It was a rather long walk. The tour guide was so knowledgeable, yet paced the information, which was shared effectively and in an interesting way. Despite a very hot day, and quite an elevation to the Acropolis, our family of youngish seniors were easily able to get to the top of the Acropolis due to strategic stopping along the way. We appreciated the efforts to avoid other groups during the information sharing, so that it was easy to hear and gave the best viewing opportunities. An amazing historical experience, and well worth the price of the tour!